There is something special about dining on the beach or by the sea, as a view of the ocean is definitely the perfect backdrop to any meal. 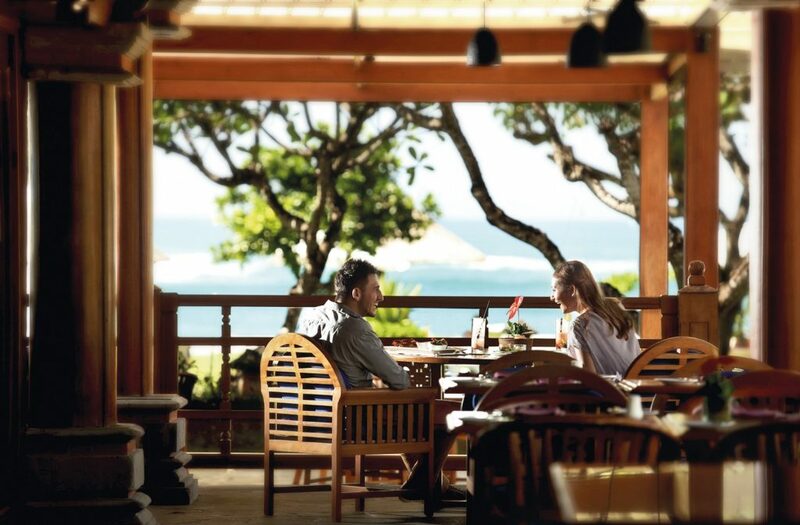 Seafood grills, Pan-Asian cuisine, home-made local favourites, or even a mix of Middle Eastern flavours, it doesn’t really matter what’s served on your table, it’s the coastal vibe of the island that really makes the experience. With your appetite now suitably whet, take a seaside seat at one of these restaurants for a true taste of the coast. 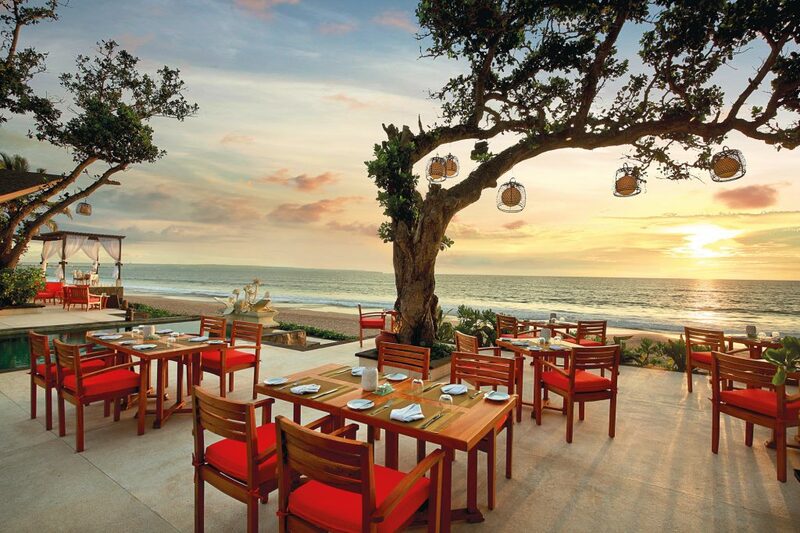 With distant views of the Lombok Straits and the Indian Ocean, the newest addition to the dining experiences offered by the Nusa Dua Beach Hotel & Spa has been turning heads since it opened. 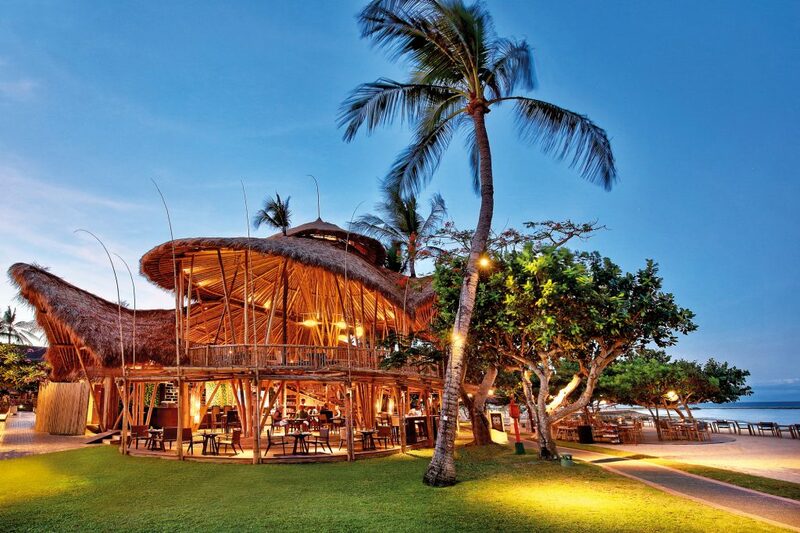 Tamarind Kitchen & Lounge is an impressive, two-storey, fully bamboo structure on the sands of Nusa Dua that brings brand new meaning to the classic ‘beach shack’. Quite unlike a ‘beach shack’ however, it is elegant and stylish, with its bamboo and earthy décor giving it a feel of home. 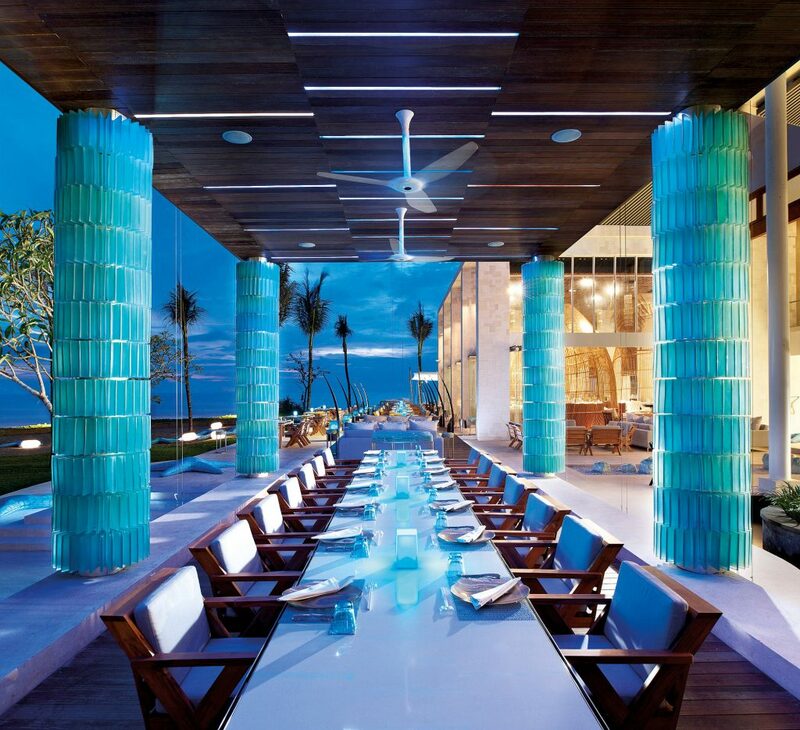 Two al-fresco floors keep you cool whilst you dine, and of course opens you to the views you came to Bali for. Tamarind has an array of contemporary Indonesian and Asian dishes and flavours, showing pride for the local heritage. However, it is the Main Course Grills that are the highlight; meats, fish, and Provencal style vegetables cooked in their old-style wood fire oven. Delicious! 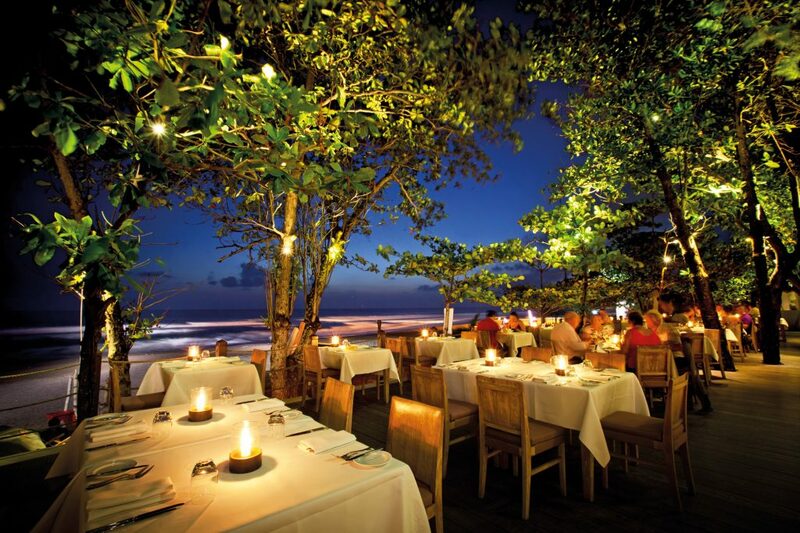 In Seminyak’sDhyanaPura is Chez GadoGado, a legendary name that has been echoing across the island for over 20 years. Cradled in the scenic beachside area, this restaurant refreshes your palate with cooling cocktails, intimate, elegant dinners and casual alfresco lunches flanked by ocean views and trailing sunsets. Whether you dine alfresco on the wooden deck or by candlelight under a blanket of stars, Chez GadoGado swaddles the palate with a taste of the ocean touched by the murmur of contented chatter. Great food with great ingredients is definitely key, but similar rules apply to the design of a restaurant; and at GadoGado no expense has been spared to create a certain swanky look and romantic dreamy spaces. Other items on the menu are primarily delectable pan-Mediterranean dishes. You can’t go wrong with the amazing seafood specialties, meat selections, or the restaurant’s perfected dessert menu as a sweet finale to end a memorable dining experience there. Speaking of dessert, you should definitely try the GadoGado’s 2002 classic chocolate melted cake with passion fruit and mango. Perhaps you can go for the full experience and savour their signature five-course set menu. Turning off the busy, Jimbaran main road, down a quiet alley towards the beach, the humble Belmond Resort has ever so considerately left its doors open to anyone after a peaceful beach bite. Nelayan, meaning fisherman in Indonesian, is Belmond’s answer to seaside dining on the much revered sands of Jimbaran Bay. Far from the smoky, mariachi-band filled tables of the Jimbaran Seafood complex, Nelayan offers an ambience that many thought was lost; a piece of the past has somehow been preserved here. Nelayan itself serves an extensive range of freshly caught fish and seafood; Indonesian spices and Western techniques come together to create food with life and gusto, unmistakably Mediterranean, at least in style and heart. With feet sunk into the sand, or perhaps under the shade of Nelayan’s open pavilion, dig into selections of Catch of the Day seafood specials, or other interpretations of dishes utilizing the best of the ocean. 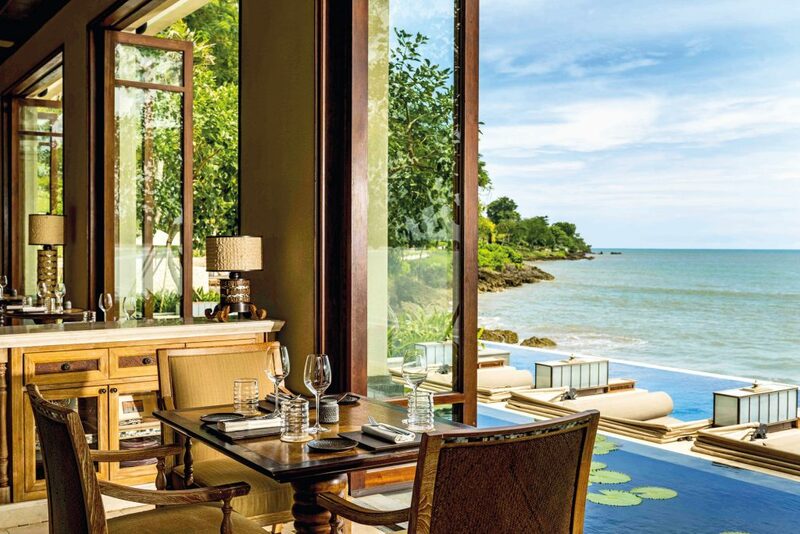 Alila Seminyak’s all-day dining restaurant sprawls from indoors to outdoors, between the bar and the main pool, fronted by ocean views. 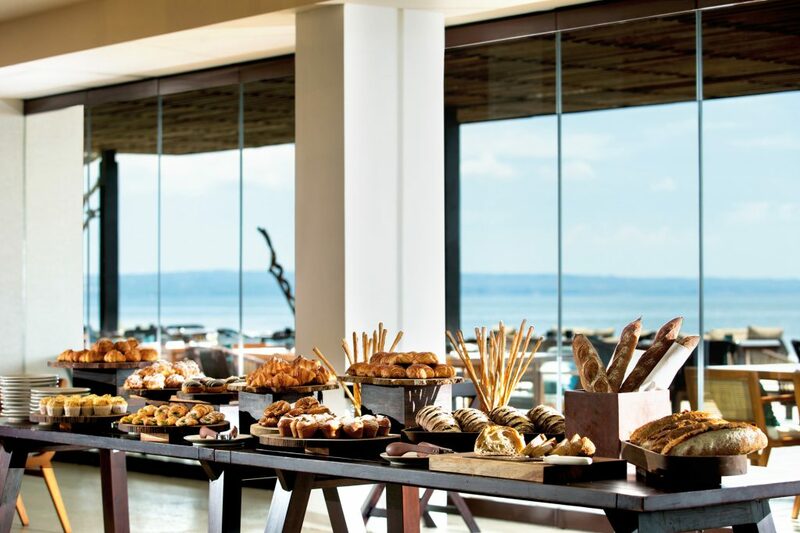 Within a relaxed bistro-style setting of communal tables, comfy seating and sun loungers, you can relish an array of delicious culinary options such as the restaurant’s chef’s breakfast selection featuring fresh-made breads and pastries, and traditional Western and Asian breakfast dishes. Lunch and dinner menus take shape in the open kitchen, featuring an Asian Noodle Bar and a Grill & Rotisserie, offering adventures into authentic and favouriteflavours. Deep into the royal compound of the Ayodya Resort, hiding in its own corner by the beach, you’ll find the iconic Lagoona Restaurant. Inside a cozy building adorned with authentic local stylings, and views out to Nusa Dua Beach, Lagoona sets itself apart with a contemporary Balinese atmosphere. Browsing the menu, a rich array of dishes are on offer, from Wild Harvest Truffle Soup to Crispy Pork Knuckle and a wide selection of grilled meat favourites. However, the seafood selection is also vast, where the Lagoona Signatures shine with hearty Seafood Paella, Giant Seafood Skewers, creamy Lobster Fettuccini and more. For an even better taste of the sea, their ‘KampungNelayan Fish Market’ dinner on Fridays brings the atmosphere of a traditional fisherman’s village to life along Ayodya’s 300-metre stretch of beach. With its warm and intimate ambience, in a space that captures the salty scent of the sea breeze, Eight Degrees South at Conrad Bali is a great reminder that you are dining in paradise. Offering romantic beachfront dining, this restaurant delivers a first-class culinary journey with a dynamic reflection of Bali’s coastal life through its menu. Whilst Eight Degrees offers a range of exquisite bites, their seafood choices will make you feel right at home as the waves lap nearby. From delicate tuna ceviché and whisky cured salmon to an all-encompassing seafood platter that offers the best of Bali’s surrounding waters. A wine to pair shouldn’t be forgotten! 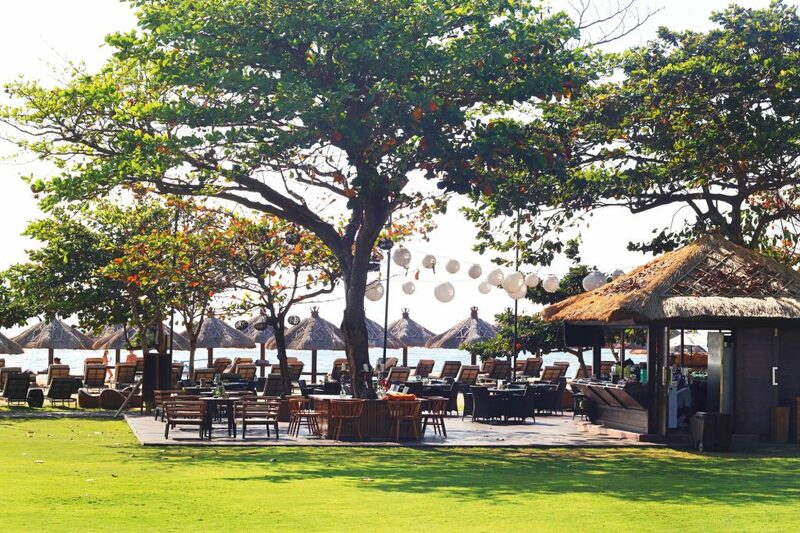 A perfect place for families, couples or even a group of friends, The Beach Bar & Grill at The Sofitel is blessed with its own peaceful stretch of Nusa Dua Beach. As its name suggests, this restaurant serves up the best of the barbecue, as well as fresh salads and comfort-food goodness; simple and satisfying bites that go perfect with a day at the beach. Take your time whiling away under a shaded spot in the resort’s beachfront coconut grove, or perhaps sip on a tropical daytime cocktail from the bar. 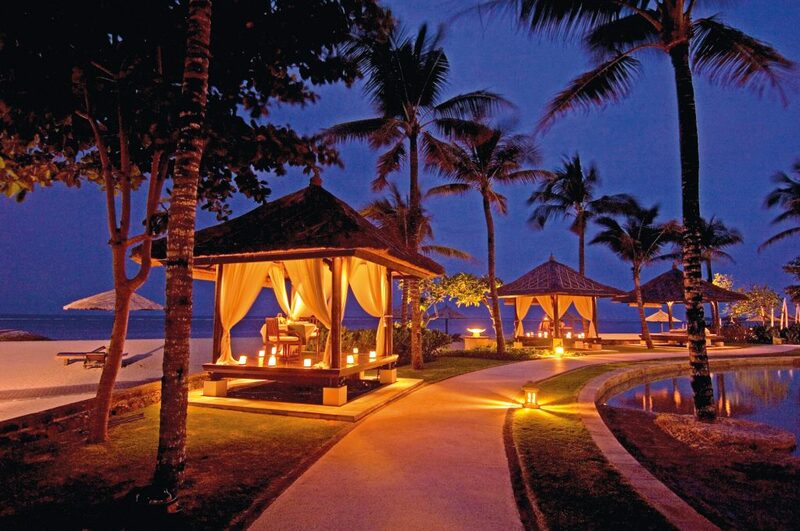 Sundara means ‘beautiful’ in the Sanskrit language, which is an appropriate name for this exclusive Jimbaran hotspot. 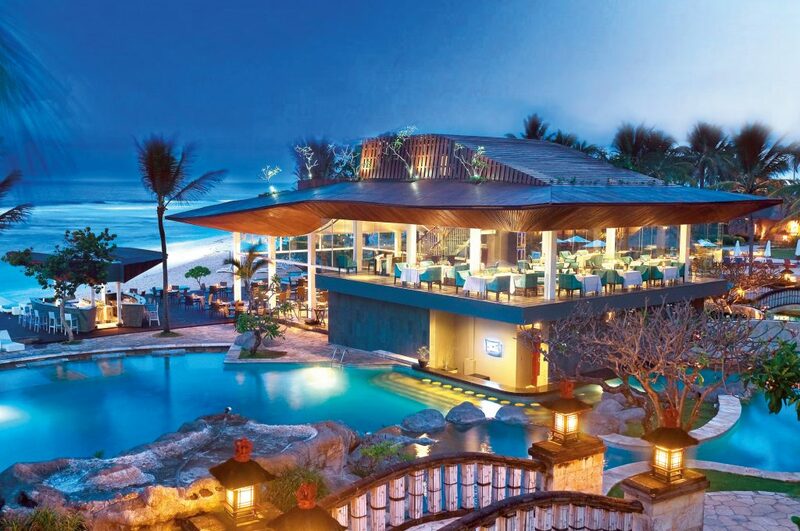 Beach club by day and ambient restaurant by night, Sundara is blessed with beachfront beauty. Their 57-metre infinity pool invites all to spend hours lolling by the sea on sun lounges or daybeds; a few sips of Sundara’s crave-worthy, signature tropical cocktails from the bar are customary too. After the sun has taken its leave, the fire pits are set alight, slipping Sundara into its warm and intimate evening atmosphere. The menu features the chef’s very own take on Asian dishes, mixing with classic Middle Eastern, Spanish and Australian flavours; dish sizes are varied too, giving the option of individual or family-style shared dining. Their ‘Cold’ and ‘Hot’ selections are filled with flavourful creations from fresh Scallop Ceviché to a succulent dish of Crispy Pork Belly; everyone has something to savour and enjoy. This signature restaurant, as one can only expect from W Bali, is anüber stylish seaside dining destination found facing Petitenget Beach. Chic and modern, with its bold sea-inspired concept, Seminyak’s sophisticated crowds flow through its doors as it invites lovers of both food and style. Offering Pan Asian Cuisine to its guests, Starfish Bloo’s culinary team will seduce anyone’s palate with its creative, new-frontier take on seafood dishes, with food presentation that often rivals the venue’s décor. There is so much to choose here, from a dirnk at the Ice Bar, the ‘Raw Rare Naked’ menu for sashimi enthusiasts, to their wine-paired degustation choices of the Indonesian Tasting and Chef Menu and of course their legendary Sunday Brunch. Sitting by the sea within the expansive lawns of Taman Bhagawan, PaonDoeloe offers a unique combination of beach, garden and culture. 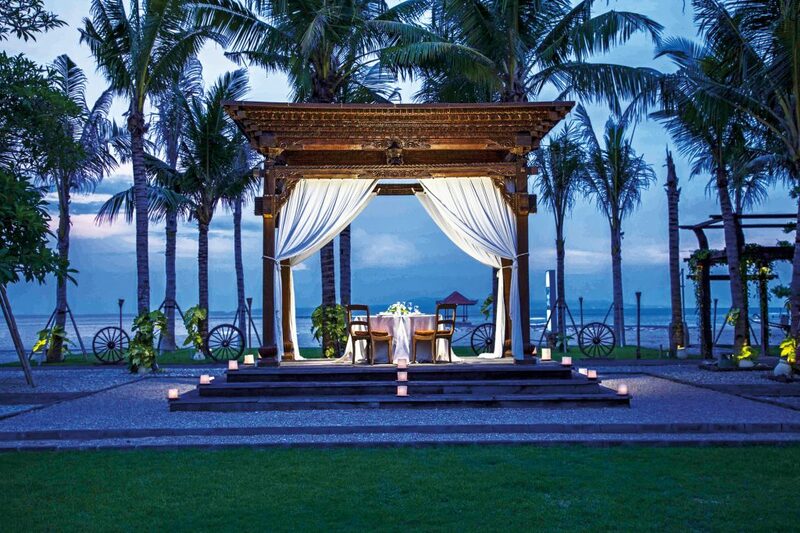 Housed in an authentic Javanese Joglo on the windswept beach stretch of TanjungBenoa, Paon is steeped in history. It showcases elegant, colonial-style table settings or sinking sofas for those after a casual evening, and the surrounding traditional ornaments from Java and vintage décor will take you back in time. In honour of the culture it represents, PaonDoeloe serves up exotic Indonesian fare, as well as other Asian cuisine rich with flavour. It is one of the few places that offers ‘jamu’, traditional Indonesian herbal remedies said to help cure many maladies. This al-fresco venue allows for a cool breeze to sweep in whilst you dine beachside, as well as open views to the ocean and Taman Bhagawan’s exquisite garden. On the far end of the TanjungBenoa peninsula, facing out to Benoa Bay, sultry Sakala stays clear of the crowds and welcomes all to their luxurious beachside escape. A crystal clear, 30-metre infinity pool is Sakala’scentrepiece, which surrounds a sunken pool bar where daytime indulgers soak and sip. At the very end, the beach sets the scene. The food at this beachfront, fine dining establishment is well renowned. They serve contemporary French cuisine, each dish presented as if a piece of modern art. Sakala’s dining experience focuses on quality produce, especially the fresh seafood of local fishermen, bright and vibrantly flavored – a true ode to the sea. Fine meats from Black Angus Veal to Wagyu Filets are on offer, even Wild Kangaroo Tenderloin features on this exquisite menu. A fine wine list the Sakalateam are proud of brings the whole experience together for a seaside meal you won’t forget. Making the most of its prime location on the legendary Kuta Beach, Tepan Noodle brings Japanese flavours back to the sea. Found under the shade of its beachfront trees, the restaurant serves up Japanese delights with international cooking styles to create Pan-Asian flavours. Located next to the main pool of Discovery Kartika Plaza Hotel, you will be treated with some of the best Teppanyaki, sushi and sashimi dishes. A number of smoky, barbecued hot plates and sizzling tempura variations are also an available treat. Complete your al fresco experience with live performances on the Theme Night Dinners every Tuesday to Saturday. 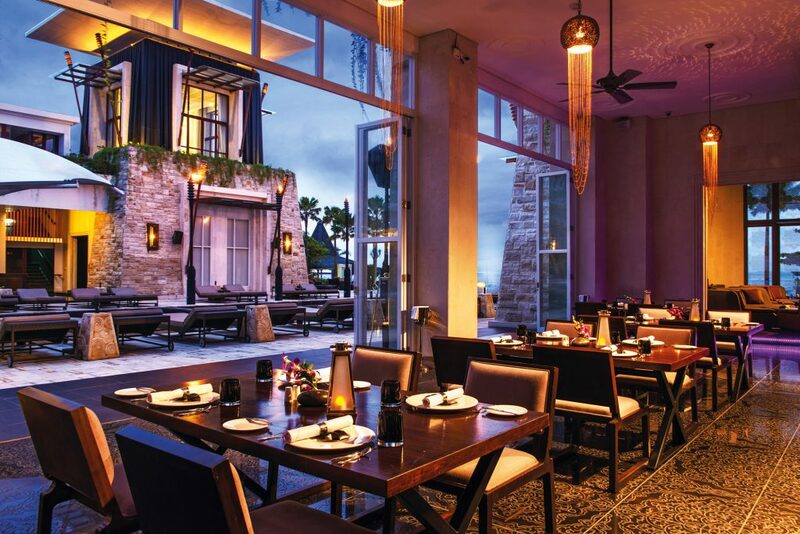 Offering a rare, semi fine dining set up inside Grand Nikko Nusa Dua’s resort, The Shore promises a cool spot to lounge with friends and family along a secluded beachfront. Choose your seat at the Aqua Mezzanine in the second level to get a more formal dining experience, on the Marina Deck at the front row seating to experience the island’s tropical lifestyle, or even sit casually on the beach to feel the gentle touch of the sea breeze. The Shore has always focused on healthy offerings, from their tasty ‘micro greens’ smoothies by day, huge array of salads and fresh starters, right the way through to their imported meats and fish.